Australia’s ancient landscape, rich Aboriginal culture, exotic wildlife and attractive, multi-cultural cities combine to make this the world’s most fascinating (and only) island continent. The sheer size of Australia, diversity of eco-systems and larger-than-life natural attractions offer a wealth of choices for travelers looking for an entirely unique and easy-to-manage destination. Home to more than 1,500 kinds of colorful fish and hundreds of coral species, this World Heritage Site is a must for snorkelers and divers. 1,240 miles long and larger in area than the U.K., it also contains the world’s largest marine park. This island group offers direct access to the Reef, where the average visibility is 50 – 75 ft. Book a day or multi-day sail to explore it’s many coves and dazzling white-sand beaches (including renowned Whitehaven) or stay on one of the 6 inhabited islands. A popular jumping off point for the Great Barrier Reef and other day trips to Fitzroy and Green Islands, the mountain village of Kiranda, the rainforest and points north. An hour’s drive north of Cairnes, this former fishing village is where the Rainforest meet the Reef and makes an excellent base to explore both locations. Its Four-Mile Beach spans the length of the town. A tropical rainforest dating back 135 million years, it contains flora and fauna found nowhere else, including 13 of the 430 species of birds. Visit with a Kuku Yulanji aboriginal guide and learn about the sacred healing powers of many plants, or cruise the Daintree River and see crocs resting on its banks. Explore the world’s largest sand island—a 75-mile stretch of empty, white-sand beach, cliffs, and rainforest. 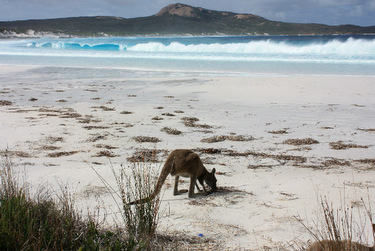 View the wildlife (turtles, whales, dingoes), swim in crystal-clear Lake McKenzie – one of 40 on the island. Camping to high-end accommodations are available. The natural harbour which drew the first European convicts, continues to draw admirers from around the world. Don’t miss its sun-kissed beaches and iconic structures— the Opera House, and adjacent Royal Botanical Gardens, the Harbour Bridge, the first settlement of ‘the Rocks’, and Circular Quay—departure point for ferries and all manner of commuter and leisure watercraft. Sail the harbor, climb the bridge for a view like no other, take a surfing lesson on Bondi Beach or sit back and enjoy the welcome of Sydneysiders who feel blessed to live in this splendid city. Just an hour west of Sydney lies a ridge of rugged sandstone cliffs that for many years proved impenetrable to the early explorers. Today, it’s an easy drive or scenic rail journey to hike and picnic among forests of eucalyptus and gum trees, dine well in historic towns, and enjoy the many spectacular viewpoints over the ridges and valleys. A surfer’s hangout in the ’70s it became the center of Australia’s bohemian culture. Visitors enjoy a relaxed beachside town, filled with music and other festivals, where there’s always something going on. 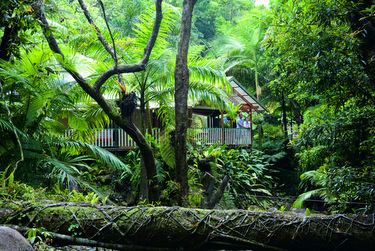 Visit rainforest retreats or stay in a range of modest to deluxe accommodations in a magnificent setting. A rival with Sydney for Australia’s favorite-city status—this cultural melting pot is known for its pedestrian-only lanes and arcades where vibrant café culture, dining, nightlife and street art reign supreme. Spectacular views are the draw on this 150-mile coastal highway stretching west from Melbourne. Hikers can do a multi-day trip on the Great Ocean walk. 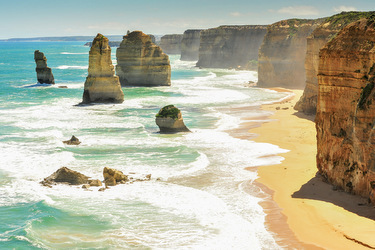 A highlight of both are the tall limestone stacks known as the Twelve Apostles. 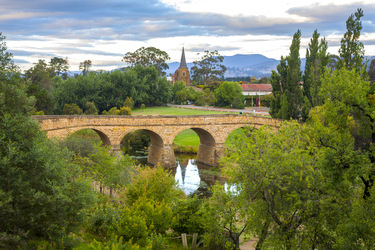 50 wineries and appealing country towns dot the countryside an hour’s drive from Melbourne. Choose excellent wines produced from cool-climate grapes, including Chardonnay, Pinot Noir, Shiraz and Cabernet Sauvignon. The sacred home of the Anangu Aboriginal peoples, the iconic majesty of Uluru (aka Ayer’s Rock) and nearby Kata Tjuta are best appreciated at sunrise and sunset when the colors change from pinks and purples to dark red, to match the color of the earth. Visit in the company of an Aboriginal guide and learn of their ancient stories from the Dreamtime. Hot air ballooning, camel safaris, cycling and walking are all excellent ways to explore the area. This frontier town and gateway to the outback is a mix of European and Aboriginal culture and a great place to shop for Aboriginal dot paintings. Visit the historic Telegraph Station, Flying Doctors Service, and go birdwatching in Alice Springs Desert Park. Hike the scenic West MacDonnell Range, to Simpsons Gap, Ellery Creek, Ormiston Gorge and other attractions, while viewing wallabies and other wildlife. Swim in cool waterholes and stay in wilderness campsites along the route. Located on the tropical north coast, Darwin’s dramatic history and melting pot of cultures make it a good base to access and explore Katherine, Litchfield and Kakadu National Parks and Arnhem Land. It is also the terminus of the trans-continental Ghan railroad and Explorers Highway. 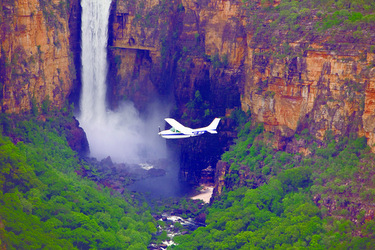 Australia’s biggest national park (Kakadu) is a lush rainforest of migratory birds, crocodiles, waterfalls and watering holes. Aboriginal Arnhem Land is ecologically similar but even more remote. 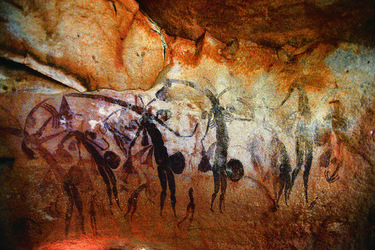 Both areas are rich in Aboriginal rock art dating back 50,000 years through modern day. A walkable and bike-able city, filled with parks—Adelaide is the cultured capital of South Australia where there always seems to be an arts or music festival going on. It’s Mediterranean climate, great beaches and burgeoning food scene, make it an attractive jumping off point for those taking the Ghan train to Alice Springs or Darwin. 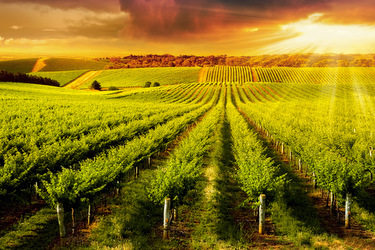 World class wineries inhabit Australia’s most famous wine region, just an hour’s drive north from Adelaide—one of 5 major wine regions with easy driving distance of the city. It’s tumultuous history as a dumping ground for convicts notwithstanding, the natural beauty of current-day Tasmania’s wilderness areas make for some wonderful hiking through its 17 national parks. From the beaches of Wineglass Bay to Freycinet, the Overland Track and Great Eastern Drive — this is a place for breathtaking views, sea kayaking or sailing with dolphins and a reputation for some of Australia’s best food. The former pearling capital still celebrates the Shinju Matsuri – Festival of the Pearl every August. 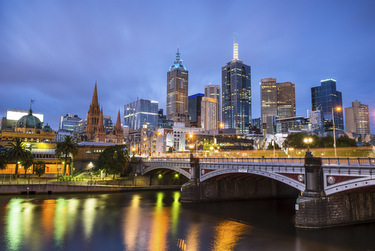 The city is a fascinating mix of Asian and Aboriginal cultures and has a glorious beach with an upmarket resort. Due to its remote location on the far west coast of Australia, this is an awe-inspiration, last frontier of immense gorges and meteor craters, tropical fjords, tidal waterfalls, and desert rivers that flow big in the wet season. Aboriginal culture is thriving here due to its isolation. Stay in an Aboriginal owned lodge, and use local guides to visit tribal lands, and ancient cave paintings. The capital city of Western Australia since gold rush days has been the jumping off point for those visiting the Southwest’s attractions —top vineyards such as Margaret River, and forests of dense karri and jarray, wildlife parks and the further inland Wave Rock. Warm sunny weather can be found throughout the year, depending on the destination. Australia’s seasons are the reverse of the northern hemisphere so their winter months—May – September are the best time to visit the tropical north and Red Centre, as the days will be cooler and drier. The southern areas of Sydney, Melbourne, Adelaide and Tasmania are most pleasant October – April. 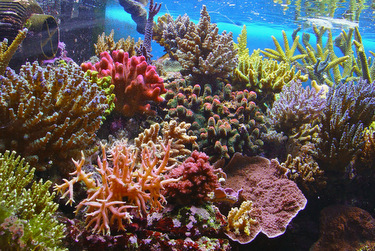 Visibility and weather for the Great Barrier Reef is generally best April – November.